Big Fish is a speciality restaurant at the Marriott Hotel in Weligama open to guests and walk-in diners. 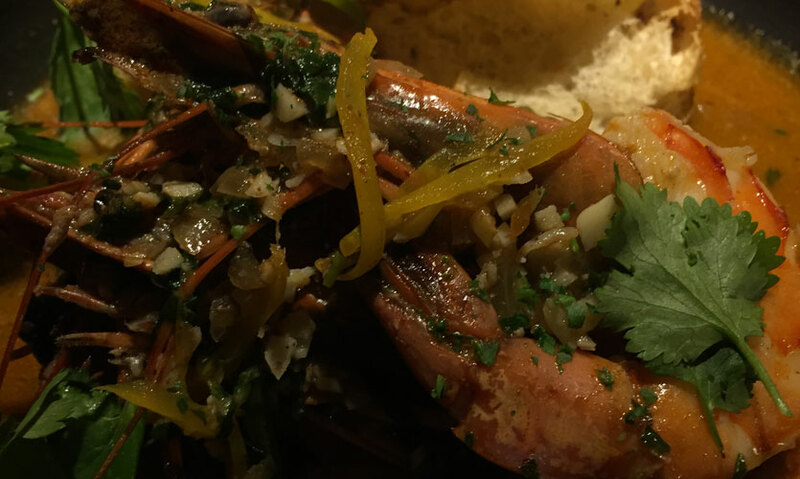 Big Fish is a chef-driven restaurant serving fresh seafood cooked to perfection. A black, grey and white interior runs as the main theme of the restaurant. Dim lighting, comfortable seating and light background music creates a very intimate atmosphere. A waiting lounge area fitted with a fully equipped bar greets you as you enter and gives guests the opportunity to sit down and have a drink before being ushered to their seating. In the middle of the restaurant, an array of fresh seafood is laid out for picking. 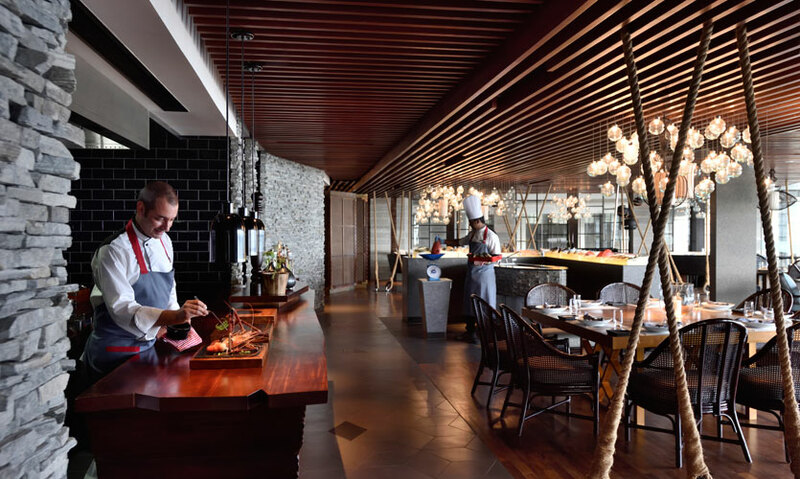 An open kitchen lies behind the table of seafood which gives diners an insightful peek into how their food is prepared. Big Fish has its own drinks menu with a variety of signature cocktails and mocktails, juices and ice teas. They also have a good wine menu which is the ideal choice of drink for seafood. 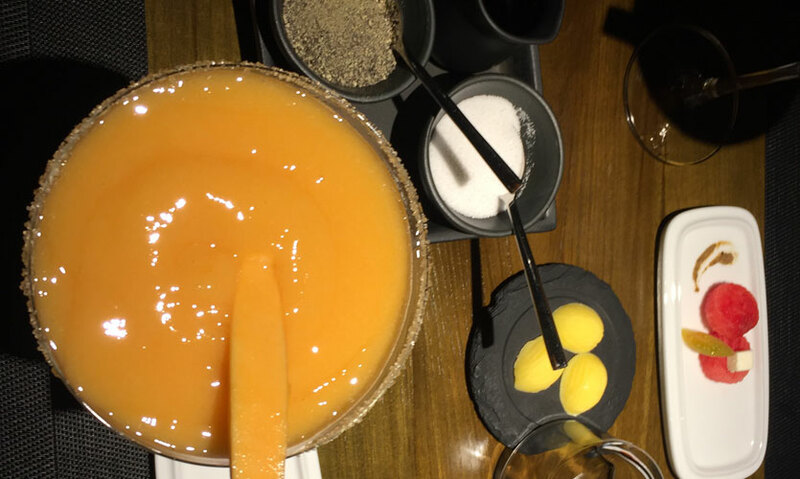 We decided to try their Mangorita which is a thick cocktail made of fresh mangoes, tequila, triple sec and sour mix. The drink had a good balance of flavour and was even a good combination with our meal! The food at Big Fish is such a divine, gastronomical experience that it’s worth even a drive to and from Weligama just to drop by for dinner. 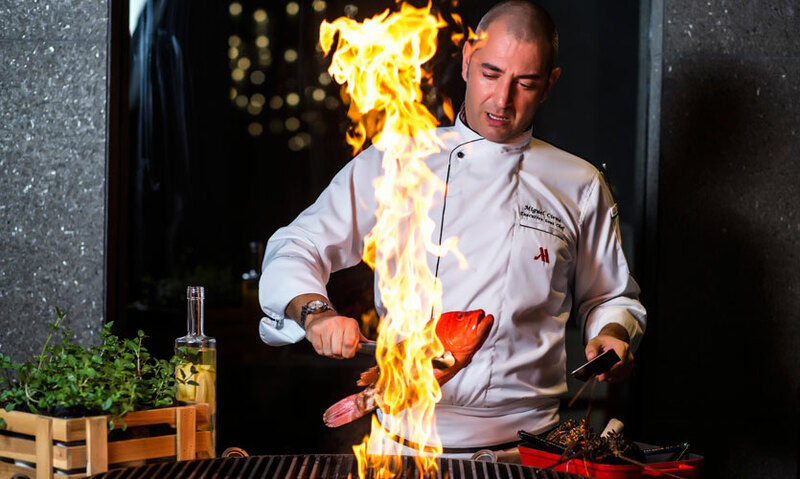 Big Fish offers an experience that’s more personal, with the head chef, Miguel Cirne himself dropping by your table to discuss your preferences and offer his ideas on what goes well with what. This is something we found super helpful because it’s always a little overwhelming deciding on what seafood you want to eat, what sides to pair and what wine to drink so Chef Miguel’s gentle suggestions were very useful. The menu has a few starters, then different seafood to be prepared in a style of your choice, sides, curated seafood dishes and desserts. For a starter, we went with their Piri Piri King Prawns (Rs. 2250) which is so priced simply because this starter may as well be the main course due to the massive portion you get. Prawns cooked in a spicy broth was served with toasted bread. The prawns were succulent having absorbed the flavours of the broth and had a spicy kick to it that we loved. 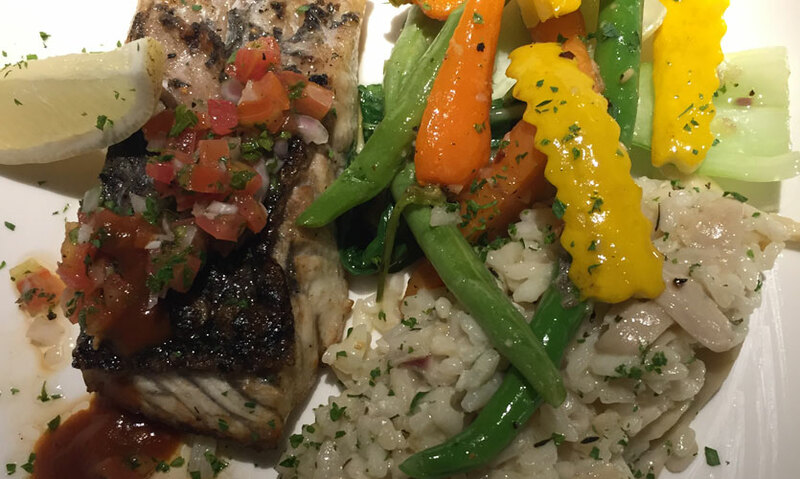 For our main dish, we tried their Round Island Grilled Barramundi with ginger sauce and mushroom risotto (Rs. 3500). Served with a chill tomato salad on top, the grilled barramundi had the perfect crispy skin with rock salt and the fish was prepared beautifully; soft and tender, melting in your mouth at first taste. The mushroom risotto was creamy and was a great choice of carbs with the barramundi. Chef Miguel has seasoned the dish to just the right touch and we were very impressed by how crispy the skin was on top but how soft and easy the flesh was on the bottom. Dessert offers a variety of two signature dishes, ice cream and a fruit platter. We decided to be adventurous and try their Coconut Mille-Feuille (Rs. 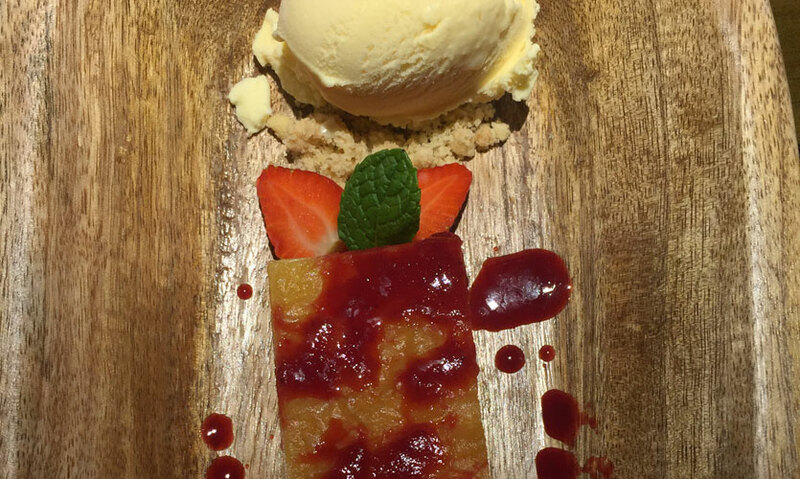 980) with a Nuwara Eliya Berry compote and vanilla ice cream. Mille-Feuille is a French pastry dessert made of several layers of stacked puff pastry with a rich custard in-between each layer. The dessert was crispy and sweet and was a good choice of dessert to wrap up an excellent meal! Chef Miguel runs a tight ship. He is the friendliest chef we’ve encountered but he’s also the strictest in the kitchen. He’s quite the busy Chef; one second he’s chatting away with guests and in another, he’s in the kitchen personally checking each dish before it’s taken out for guests. His casual, easy-going demeanour made our dining experience a pleasant one. His staff is equally friendly and attentive and it’s this sort of service that really tops off your night on a good note. A large car park is available at the hotel. Valet parking is also available. Both a men and women’s washrooms are available at the restaurant. Would we go again? Most definitely yes! Should we ever find ourselves down south, Big Fish is a restaurant we would love to visit again.